Both of my kids loved to draw and paint when they were small and I had a hard time tossing the hundreds of projects they made. When Eden was small, I thought it would be best to start a little “portfolio” to track her developing skills as an “artist” and her beginning writing skills. This allowed me to pick some of the best samples of her work and let go of the realms of other art projects without feeling guilty. Of course, I have done the same thing for Shay. I titled the pieces when applicable and tried to date their work as they did it. I used an inexpensive 12″ X 12″ scrapbooking album. The cover of the books are canvas, but covered with a clear protective layer, so I was able to slide in my own title page for their art portfolios. The kids made handprints and I incorporated them into the title page on the cover. The books are post-bound albums and allow for expansion of the book and page additions. The layouts are very simple with just a hint of embellishment to bring the art piece to life. I used black pages for both books, as the art shows up so well against the black. What I really love is how the collections also reflect their interests and the stages that the kids went through. As they have gotten older, they spend much less time independently drawing and painting. When they do, they have more stamina and will often produce one or two pieces rather than the 20 that might have been produced in one sitting when they were smaller. I have also added some of their school art projects as well. I am a little behind and have a stack of papers to go through and add to their art portfolios, but I have purposely kept the embellishments to a minimum and the layouts simple, so I can usually do an entire year for both kids in one day. Maybe updating the books will be a Christmas holiday project?? Here is a gallery of snapshots from their art portfolios. I just took a few random shots to give you an idea of how to go about making your own. I have a wavy cutting tool from Creative Memories and use that a lot to dress up a page with very little effort. Another favourite embellishing tool is coloured tape. I can add it to a plain page and give it a lift without spending much time on a layout. I have arranged their books in chronological order to reflect their growth and development. You can also see how some pictures were cut out and mounted on cardstock to help them standout on a page. The key to keeping this manageable is keeping it very simple. I can literally do a layout in about 15 minutes (or less if I am “0n a roll”). The simple design of the pages means you can rattle off many layouts at one time. The other key to success, is filing and dating the work, so that it can easily be sorted when you go to work on it. When the kids were younger, I had to commit time about 3 to 4 times per year because of the amount they produced and how much their skills changed in a very short period of time. Now, I set-out approximately one day per year to update their art portfolios and find that the amount of work is still manageable. Click the images to enlarge. Again, each single page is 12″ X 12″ in size, so a double page layout is 24″ across. I also wanted to include samples of their first attempts at writing independently. This is Shay’s dolphin picure and writing, made a few months before his fourth birthday. Eden went through a stage in which she made a small sketch in the middle of a piece of photopcopy paper. I decided to cut them out into circular shapes and mount them. This allowed me to display several in one layout. Edens’ book is on top and Shay’s is on the bottom. You can see that he was hooked on Star Wars during this time period. He would make hundred’s of paper characters and play for hours! 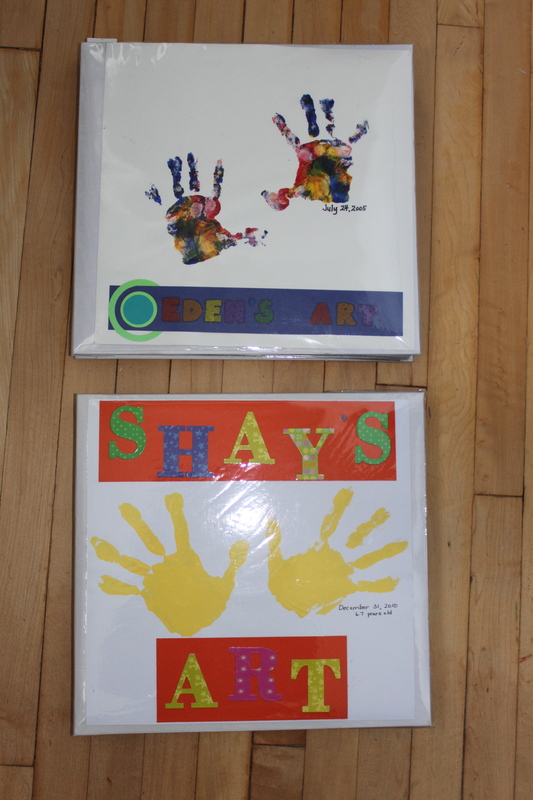 Again, Eden’s book is on the top and Shay’s is on the bottom. The large sun is part of the layout. You can see the year and her age on this layout. She is a January birthday, so it makes sense to include both. This is an example of how coloured tape can be used to dress up a page with little effort. You will also notice that I have labelled some of the items in the pictures and have even made short “journal” entries where applicable. In some cases, I wanted to explain a situation, phase or particular interest at that given time. Journaling helps to capture the entire memory. Have you ever considered working from home? A revolutionary blogging system is hitting the market within the next few days. If you are interested in learning how to blog and earn money from home, you need to click this link. Posted on October 20, 2013 by Cindy Roy •	This entry was posted in Family, Organization, Projects and tagged an art scrapbook, art portfolios, children's art portfolios, children's art work, how to keep your children's art, storing children's art. Bookmark the permalink.